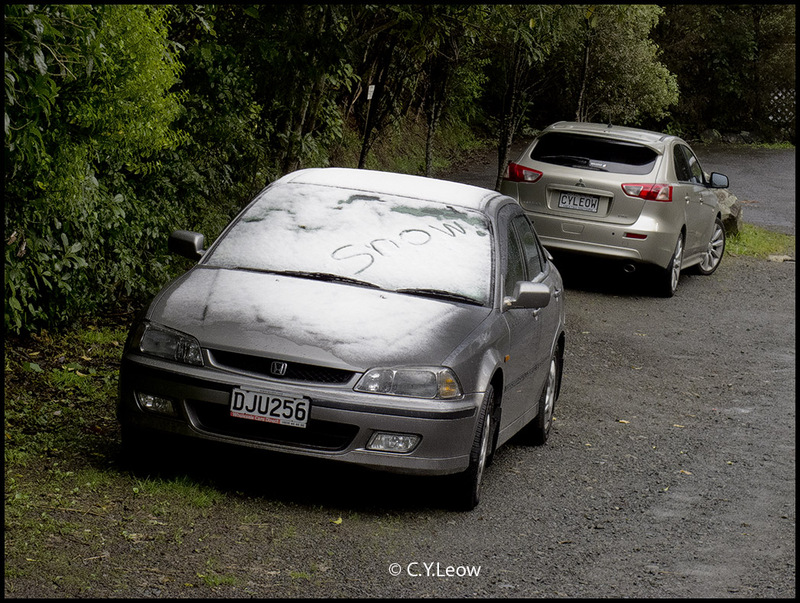 Winter is truly here! It is so bleeding COLD! As a matter of fact, they told us it is the coldest in 25 years! 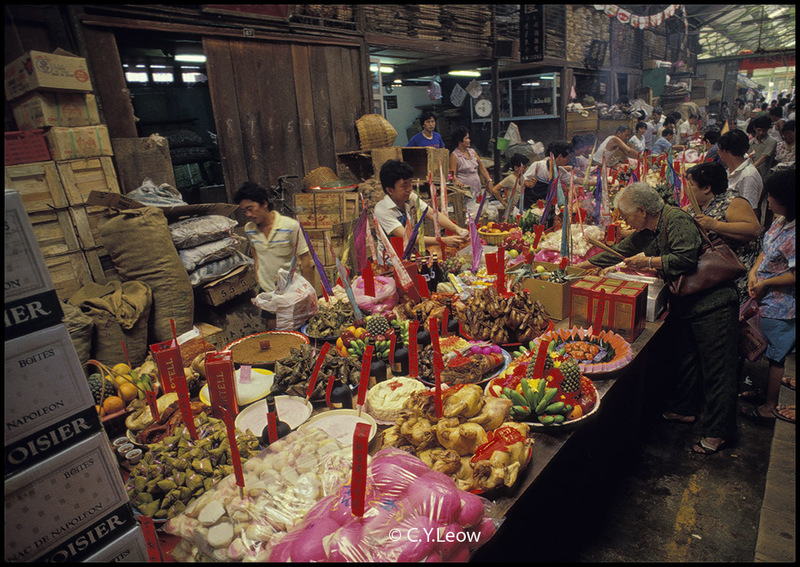 Down memory lane... this was taken in the late 70s at Sia Boi Market in Penang during a "Hungry Ghost Festival". I remember fondly, during those days; the rather dirty market was a very popular place to eat "economy rice". The market was operated 24 hours a day too! Economy rice stalls typically consist of a glass case containing anywhere from 10-15 troughs of cooked food, including meats, vegetables, eggs and tofu. Customers select any combination of these dishes, which are served accompanied by a portion of steamed white rice. 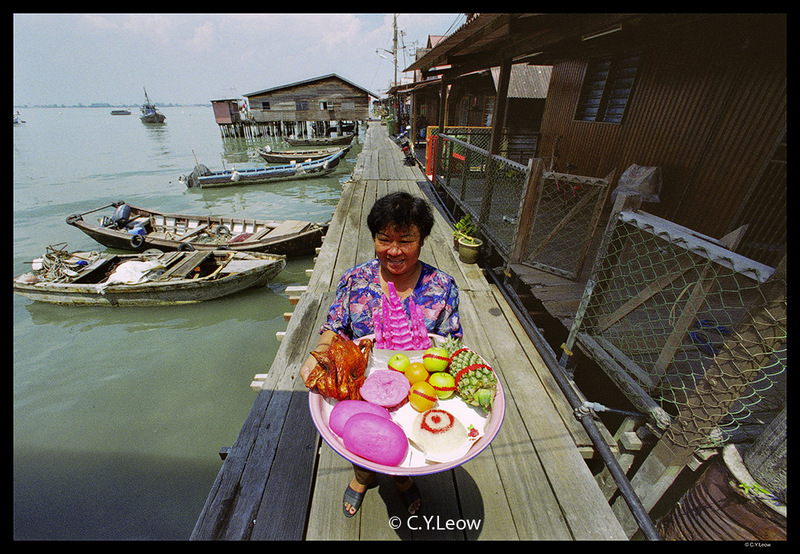 In Malaysia, it is more common to find the food on open troughs keep warm by hot water and electric heater below. I kicked myself for not taking shots of this Penang icon before it was demolished! The indoor festive offering was shot on Kodak Ektachrome colour slides film with a Leica M4-P and the incredibly small Summilux 35/1.4 lens. A photographer's nightmare... to retain the ambiance and the thick smoke, you have to shoot without flash. 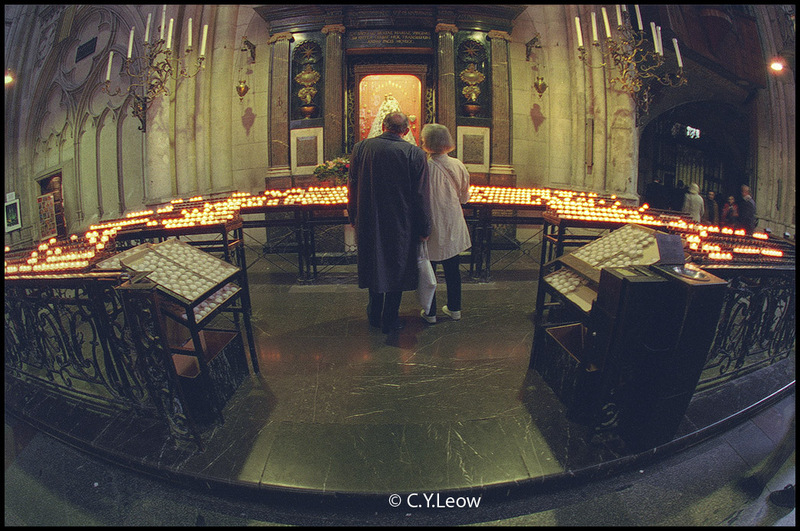 Since I shot with a Kodak DCS520 digital camera and 15mm fish-eye lens at ISO 800, it was digital noise galore! The smoky scene was shot during a temple celebration, somewhere in Ipoh; 1998. Young "waiters" serving vegetarian meals to the devotees who bunk-out for nine days in a Perak temple during the Nine Emperor Gods Festival. The picture was used in the "Soul Of Our Nation" published by The Star in Malaysia. Kodak DCS520 digital camera, Canon 15mm f2.8 fish-eye lens; fill-in with a flash bounced off the ceiling. 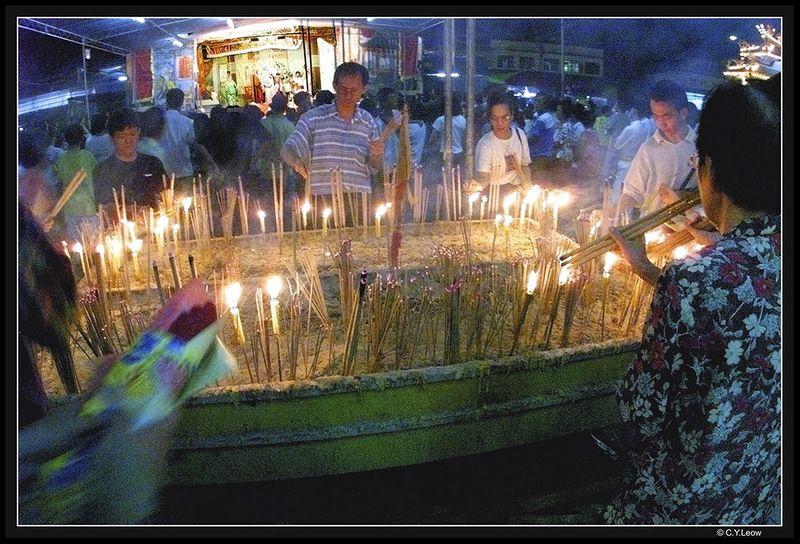 A traditional offering to the God of the sea during the Nine Emperor Gods festival in Penang, Malaysia. Local fishermen believe that the yearly ceremony will bring them back safely. A ladder was used to get this shot. 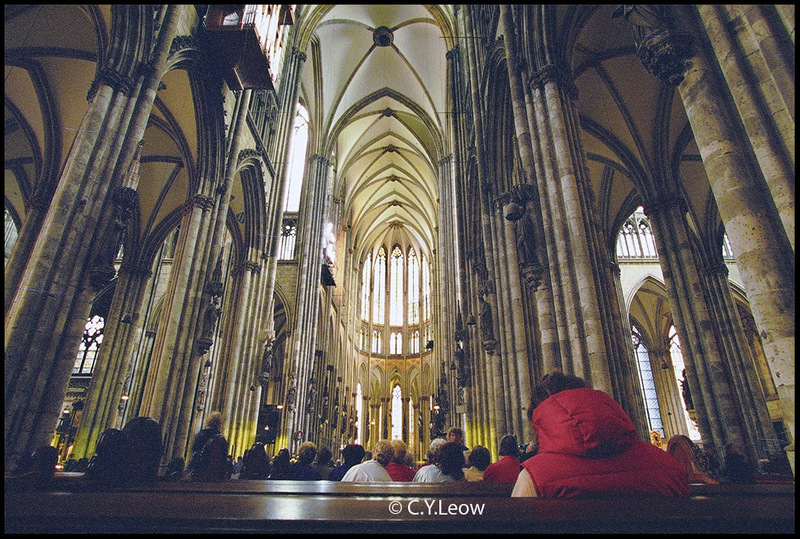 Canon EOS1n and 14mm f2.8 lens on Kodak Ektapress 400 film. 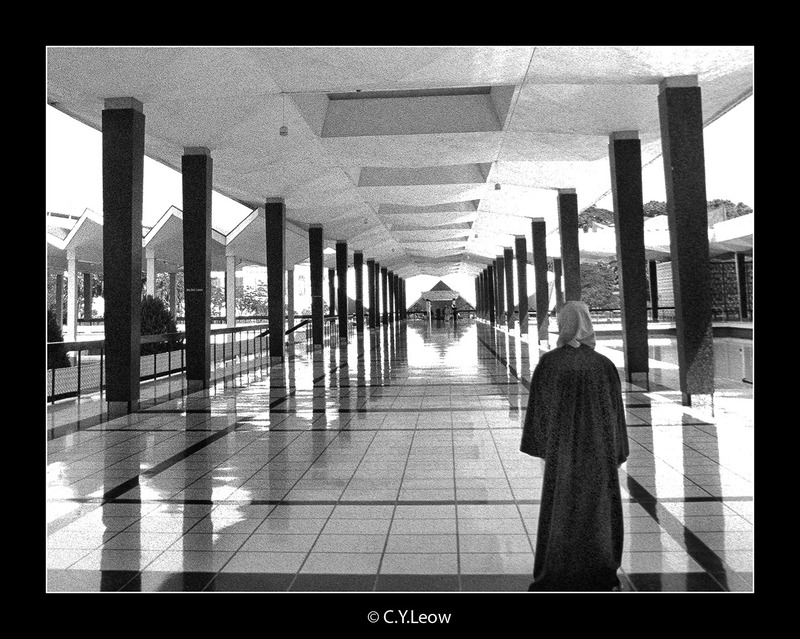 This shot was done at the "Lim Jetty" in the Penang. Lim Jetty is one of the six existing clan jetties in George Town. Also known as Seh Lim Keo in Hokkien, it is the clan jetty nearest to Pengkalan Raja Tun Uda, the ferry terminal. Today much of Lim Jetty has made way for development, with a large tract of the waterfront being reclaimed to make a parking lot. Immediately to the south of Lim Jetty is Chew Jetty. This site consist the ferry terminal on the extreme right. The jetty on the left belong to Malaysia's custom. The first wooden jetty is Lim's Jetty. The residents settled here during the early 1900s. They migrated from southern China, the Hokkien's province. Mainly local fishermen. They end up here working as cheap hard labours along wharf known to local as 'kooli'. Most of the residents still living here are from Lim's clan. 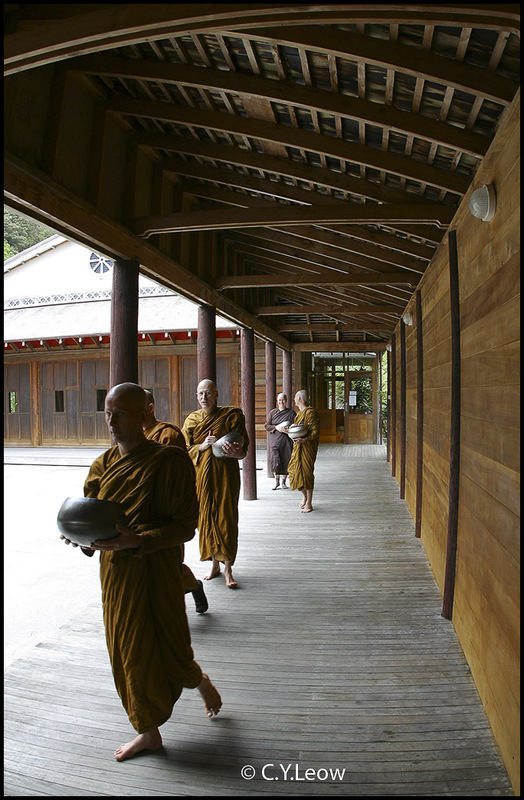 The houses were built on stilts, timber flooring, wood panellings and corrugated zinc roofing. In the early sixties, most roofs were made of 'attap' leaves cost only 20 cents, the same 'attap'leaves now is selling at RM 8.00 in Kuala Lumpur! 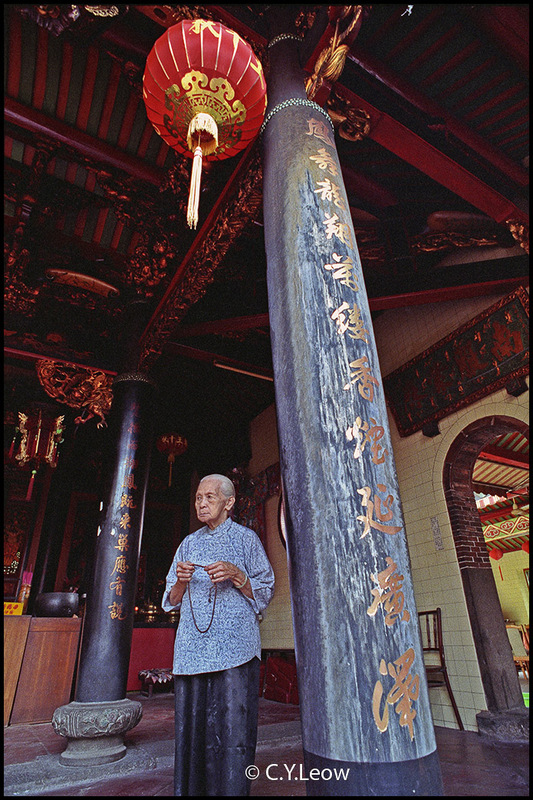 A 90-year-old devotee at a temple in Singapore. 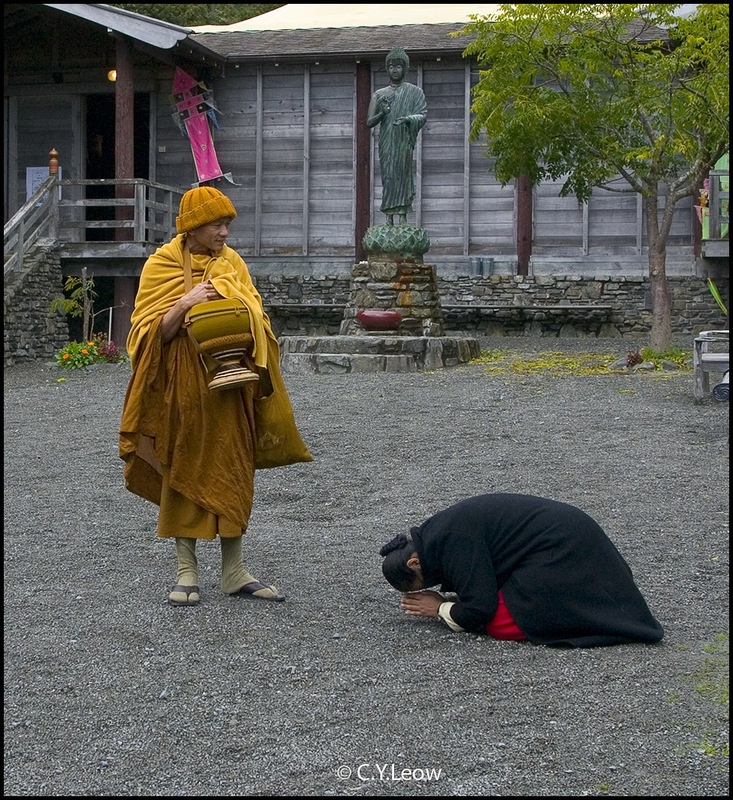 Same type of camera, lens and film for "Jetty Prayer" were used. 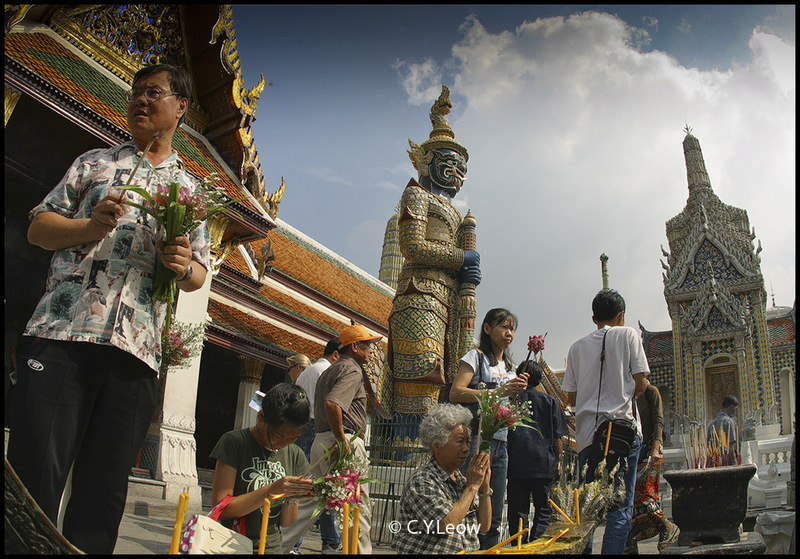 Devotees at the wat of the Grand Palace, Bangkok. Devotees offering candles at the famous Dom Cathedral in Cologne, Germany. Available (candle) light shot with a 15 mm fish-eye lens. Kodak Ektapress film. Woman in Red... same location as above, 14 mm ultra wide was used. 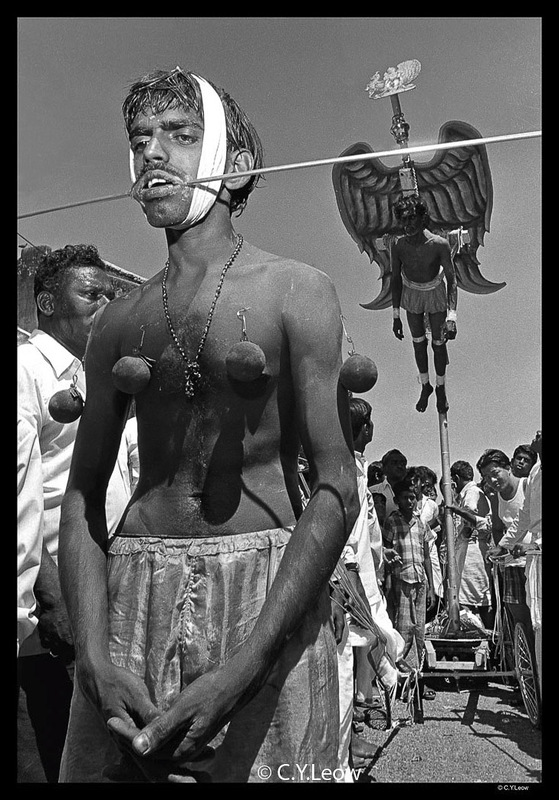 The "Bird Man" of Penang, at a Thaipusam festival. One of my favorite black & white shot. Shot with a Nikon F2 and 20 mm lens on Kodak Tri-X 400 film. The beautiful marbled floor at the National Mosque of Malaysia. 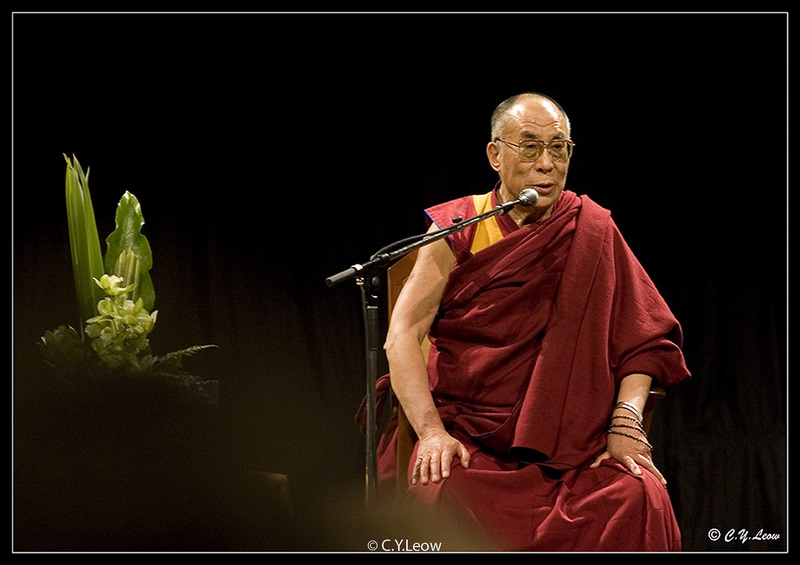 His Holiness the 14th Dalai Lama at the TSB Arena Convention Centre, Wellington. Visiting Tibetan monks creating a extremely delicate sand mandala in Auckland. The Sand Mandala (Tibetan: དཀྱིལ་འཁོར།; kilkhor) is a Tibetan Buddhist tradition involving the creation and destruction of mandalas made from colored sand. 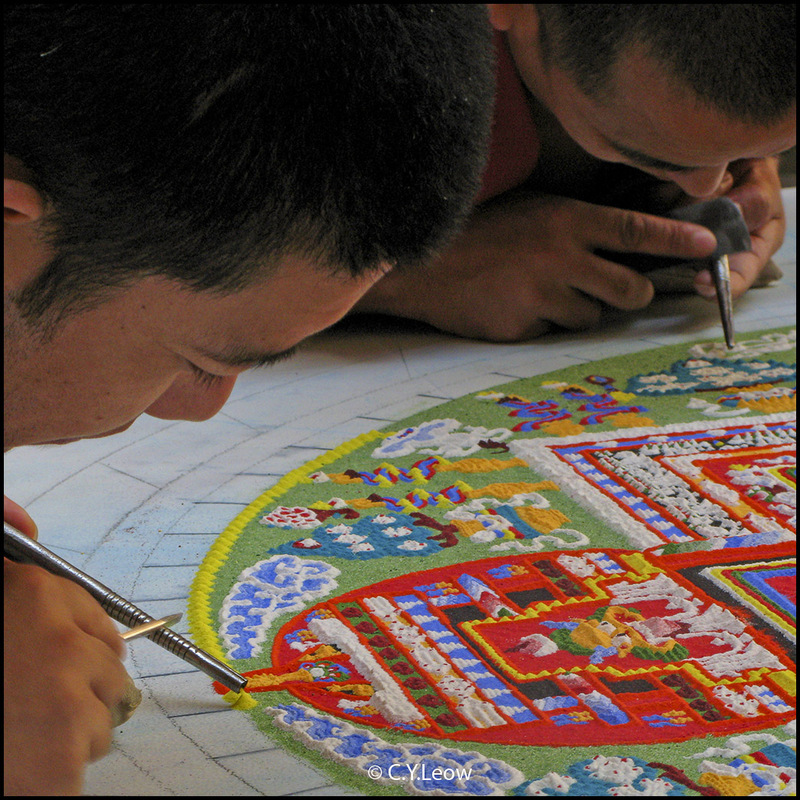 A sand mandala is ritualistically destroyed once it has been completed and its accompanying ceremonies and viewing are finished to symbolize the Buddhist doctrinal belief in the transitory nature of material life. The sand painting creation was shot with a Canon G7 P&S. Look at the sharpness! 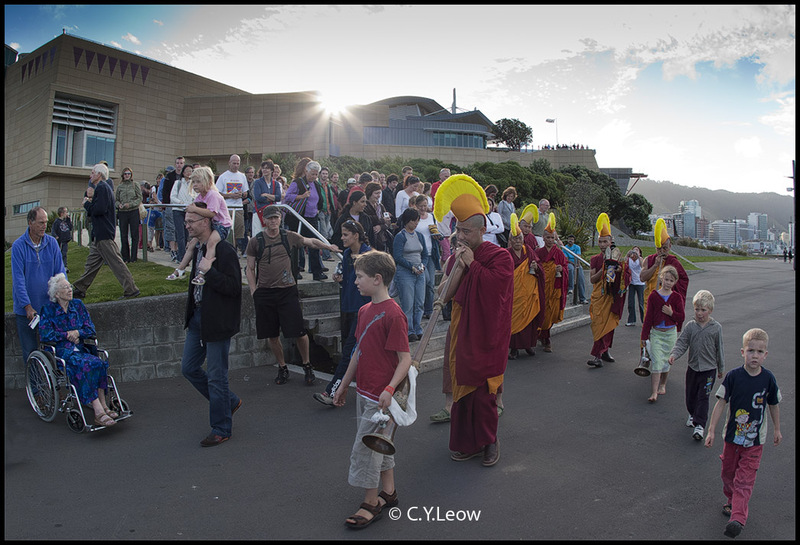 Same group of visiting Tibetan monks, now in Wellington; heading to the waterfront at the back of Te Papa museum to ritually destroy their mandala. My Canon 30D DSLR with a 15 mm fish-eye lens was shooting into the setting sun, love the effect! Kudos to Canon for a great lens! 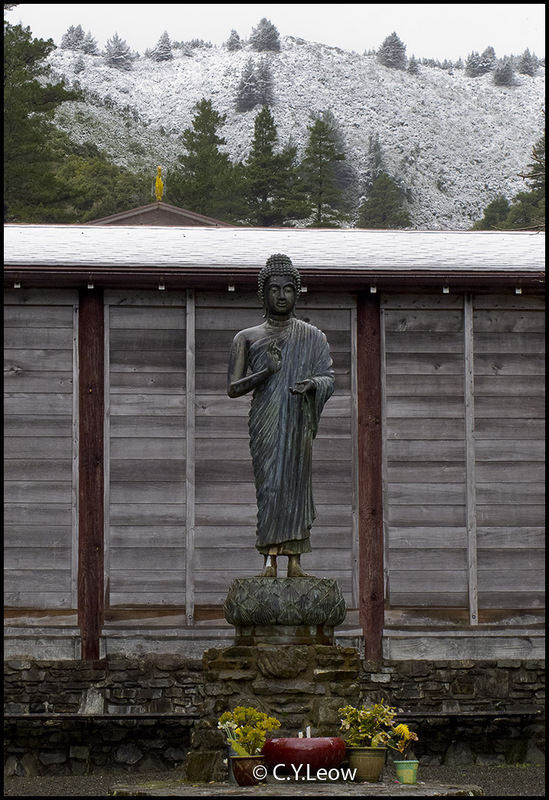 Finally, the last three pictures were taken at the Bodhinyanarama Monastery, Stokes Valley; Lower Hutt.